Gypsies, Roma and Travellers are some of the most marginalized and vilified people in society. They are rarely seen as having a place in a country, either geographically or socially, no matter where they live or what they do. Another Darkness, Another Dawn is a new history that charts their movement through time and place: from their roots in the Indian subcontinent, across the Byzantine and Ottoman empires to western Europe and the Americas, to their place in the contemporary world. This history of Romani people demonstrates how their experiences provide a way to understand mainstream society's relationship with outsiders and immigrants, both in the past and present. 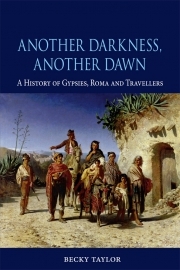 Rather than seeing these peoples as separate from the societies in which they have lived, and as untouched by history, this book sets Gypsies' experiences in the context of broader historical changes. Understanding their history is to take in the founding and contraction of empires, the Reformation and Counter-Reformation, wars, the expansion of law and order and of states, the Enlightenment, nationalism, modernity and the Holocaust, as well as the increasing regulation of modern society. It is as much a history of ourselves as it is a history of 'others'. Ultimately Taylor demonstrates that history is not always about progress: the place of Gypsies, Roma and Travellers remains as contested and uncertain today as it was upon their first arrival in western Europe in the fifteenth century. To visit Becky Taylor’s website please click here. Becky Taylor is a lecturer in History at Birkbeck, University of London, and is the author of A Minority and the State: Travellers in Britain in the Twentieth Century (2013). Introduction: In Search of the ‘True Gypsy’?